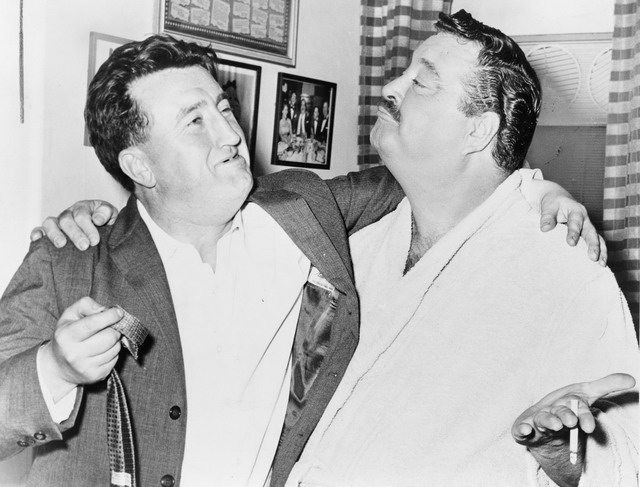 Photo of Brendan Behan and Jackie Gleason in New York, 1960, from Wikimedia Commons. “On the wagon is an amateur phrase. 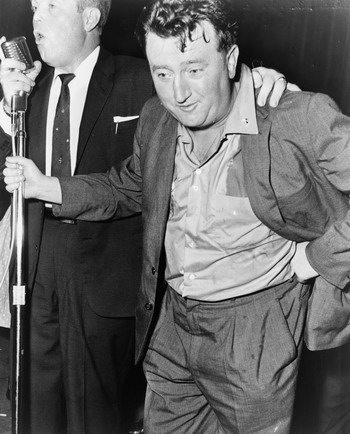 You’d never hear it from a professional alcoholic,” Brendan Behan mused to Toronto reporters. “It’s a tribute to the sheltered life of the person who uses the expression.” Though he’d struggled with sobriety for years, he understood the public’s expectation that he fulfill his well-cultivated image as a hard-living boozer. Visiting the city as a member of a stage production at the O’Keefe Centre, the rebellious and iconoclastic Irish dramatist would fall off the wagon like a true professional during his stay. A week-long binge, with stopovers in jail and police court on charges of disorderly conduct and assault on a police officer, would end with Behan nearly dead, lying in a coma in a local hospital. 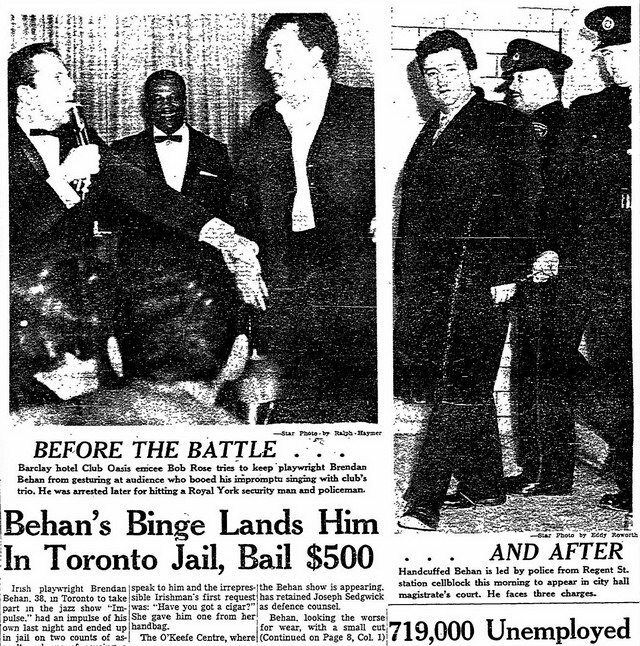 Behan barrelled into Toronto on Sunday, March 19, 1961, in an unhappy mood. Days earlier, in New York City, he’d been publicly humiliated when he was barred from participating in the city’s annual St. Patrick’s Day Parade over organizers’ fears he’d be an embarrassing nuisance. 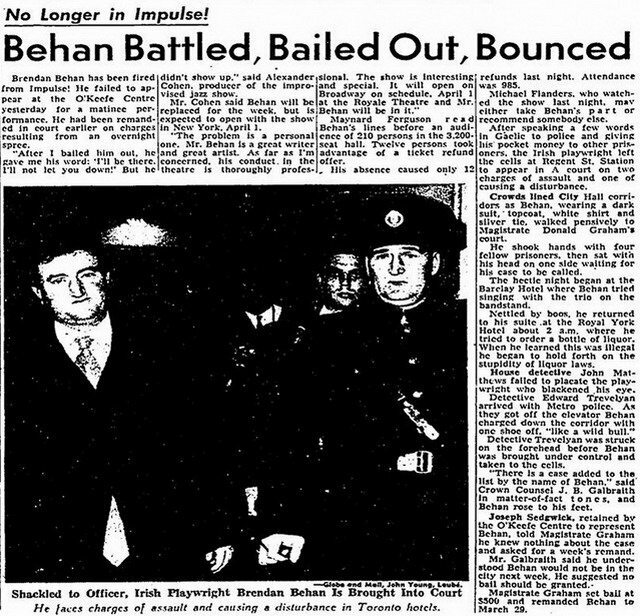 From brandishing a pistol at an Irish Republican Army rally-turned-riot at the age of 13, to participating in an abortive bomb plot and assaulting policemen as a young man, Behan was an “incorrigible rebel against authority,” as one obituary put it. These youthful, seditious activities and resulting spells in prison informed his first stage play The Quare Fellow (1954) and his major breakthrough, the autobiographical Borstal Boy (1958). Though he eventually steered clear of the IRA—working as a house-painter and journalist before finding fame as a writer—he never abandoned his rebel spirit. A hard drinker, Behan’s inebriated television appearances added to the mystique that surrounded him. “For millions who had never met him, he had become a symbol of revolt,” biographer Ulick O’Connor wrote in Brendan Behan (Hamish Hamilton, 1970). “With his open-necked shirt, his cursing, his drunkenness in public, his contempt for convention, he made an instant appeal to a generation that was attempting to shake off the straight jacket of urban conformity.” As his fame grew, so did the burly author’s compulsion to drink—not just as a weakness in himself, but in fulfillment of the tempestuous image the audience expected. Article from the Toronto Star (March 21, 1961). Behan’s stint in New York City for the 1960 staging of his play, The Hostage, was emblematic of his struggles with the bottle. He arrived drinking nothing stronger than milk or soda water. But the play was a tremendous success with audiences and critics alike, and his evenings down in the pub grew longer and more rollicking, with Behan leading singalongs interspersed with his exclamations of “Up the Republic!” By the time he was giving a speech at McGill University that December, his noisy bluster had lost its usual charm, and his drunken sermon—against the Crown and for Quebec independence—offended the mostly Anglophone audience. A second speech scheduled for Montreal was cancelled by the organizers. Back in Dublin that winter, drinking as hard as ever, Behan spent his time getting tossed from pubs and landing himself in court when an argument with a grocer over the price of champagne escalated into a fistfight. Worried, and knowing that he couldn’t trade off of the reputation of Borstal Boy and The Hostage forever, Beatrice implored him to write. 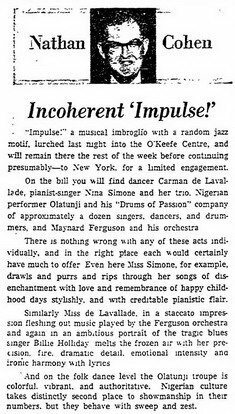 Then, in the winter of 1961, O’Keefe Centre impresario Alexander Cohen asked him to host Impulse!, a jazz revue in Toronto that spring. 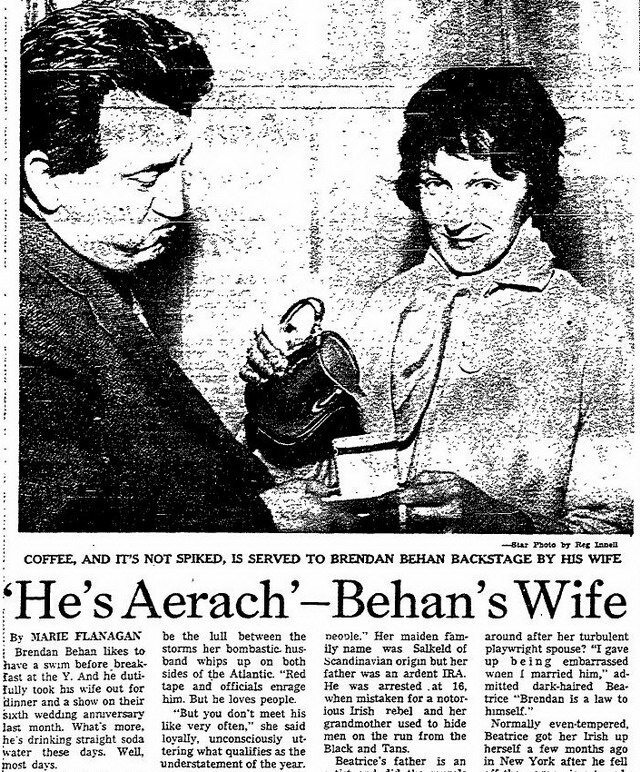 The wages offered—a reported $3,000 per week—overcame Behan’s initial hesitation, and he accepted in February 1961. Front page of the Toronto Star (March 22, 1961). Enraged and craving drink, he badgered the hotel staff to supply him with a bottle over the telephone for hours, alternately pleading and threatening them. The hotel’s night manager, the Star reported, even cut power to the elevator to ensure Behan remained on his floor. Finally, around 6 a.m., the police arrived. As a true Irish republican, Behan had no affection for the constabulary. And as they approached, the stocky dramatist—in shirt sleeves and missing one shoe—bull-rushed the officers down the hallway. He landed a few blows, but was wrestled to the ground by Detective Edward Trevelyan and another officer. “He thinks he is a strong man, but there’s not much muscle, only fat,” Trevelyan told the press, once Behan was safely stowed in a cell at the police station on Regent Street. Article from the Globe and Mail (March 23, 1961). Disheveled and hungover, but sporting a crisp dark suit and silver tie, Behan joined the night’s haul of petty thieves, vagrants, and prostitutes in police court at Old City Hall at a little before noon. With Behan facing charges on two counts of assault and one of creating a disturbance, his lawyer asked for a week’s remand to prepare a defense. The magistrate agreed, setting bail at $1,500. 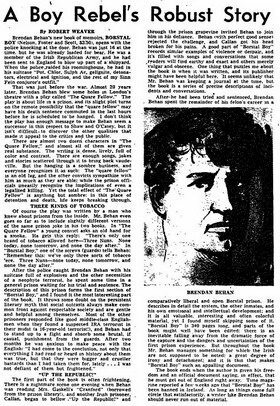 Not even the media attention for Behan’s arrest could save a production that critics had called “a flimsy frippery.” At its lowest, the cast performed for an audience of only 210—prompting the 3,200-seat theatre to tighten up its refund policy because so many ticket holders wanted their money back. Within days, Impulse!‘s New York City run was cancelled too. Within hours of being fired, Behan was back to his loutish drinking and insisted upon joining the band on stage at the Walker House Hotel. Though his antics were tolerated by the musicians and ignored by the crowd on this occasion, it was to be but the first stop on a days-long binge. Increasingly worried about her husband’s health, Beatrice insisted Behan enter the Sunnyside private hospital, a local treatment centre for alcoholics, on March 26. Shortly after his admission, the dramatist sank into a diabetic coma brought on by excessive drinking. His attending physician, Dr. David W. Pratt, warned Beatrice that death was near. Day after day, Beatrice sat at her husband’s bedside, as she’d previously done on his numerous booze-induced hospitalizations. His face grey with strain, and his eyes dark and sunken, Behan was more ill than he’d ever been—but rumours he’d actually died were quickly corrected by the newspapers. “I always thought you would do the noble thing and drink yourself to death,” Behan’s long-time friend Eamonn Martin had told him when visiting the playwright in New York in 1960. “I just about did,” Behan had replied at the time, seemingly aware of the perils of the public image he’d cultivated. “It’s a wonderful thought until you get too close to actually doing it.” Like Behan, Martin had been born into an IRA family. He’d been helping his friend escape scrapes with the law since they were both teenagers, then traded Dublin for Toronto in 1953 and became a TTC inspector, arts advocate, and left-wing activist. Now, with Behan in his sick bed, Martin comforted Beatrice. After about a week, Behan was able to sit up, though he was still too ill to leave hospital. “It was the strain of work and then suddenly going on the gargle,” Beatrice told the press on March 29. “I was very concerned about him. But he seems much better today.” Behind the scenes, Beatrice was surprised when Dr. Pratt asked if her husband had ever suffered a serious head injury. He had, she explained, in youthful fist fights and mistreatment in prison. “I would like him to undergo neurological tests,” Pratt said, suspicious that Behan’s compulsive drinking might be linked to neurological damage. “I think there may be pressure on his brain causing him to behave as he does.” But, when Brendan objected violently to a neurological examination, Pratt and Beatrice abandoned the line of inquiry. But, feeling he’d been made to appear foolish in some local newspaper coverage, Behan also unleashed a torrent of insults from his hospital bed. “I don’t want anything I have written to be on the CBC, or on stage or sold in bookstores in Canada,” he raged. “I want to get away from the Toronto Sabbath, which is 50 per cent bootlegging,” he added. He regretted ever having come to town. Released from hospital on April 13, Behan and his entourage proceeded immediately to the police court at Old City Hall. When the case was heard, after being remanded again until late April, the magistrate treated the Irish literary icon as any other petty criminal. Behan was found guilty on two charges of assault and was fined $200. 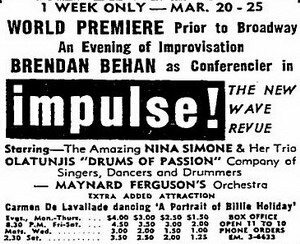 Feeling rejuvenated, Behan raced across the country to join a production of The Hostage in San Francisco. When Beatrice joined him a few days later, she found him unconscious in their suite, surrounded by empty bottles. The spree was followed by another hospital stay before Behan, on and off the bottle, eventually returned home to Ireland to try and dry out. 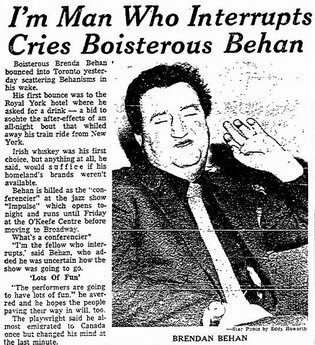 “Pushing past reporters,” the Globe and Mail reported of his arrival in Dublin, “Behan and his friend went to the airport bar where they shook hands with everyone and then drank several whiskies.” He died in March 1964. Sources consulted include: Beatrice Behan with Des Hickey and Gus Smith, My Life with Brendan (Nash Publishing, 1973); Michael O’Sullivan, Brendan Behan: A Life (Roberts Rinehart Publishers, 1999); Ulick O’Connor, Brendan Behan (Hamish Hamilton, 1970); numerous articles reprinted in E.H. Mikhail, ed., Brendan Behan Interviews and Recollections, Volume 2 (Gill and Macmillan, 1982); and press coverage from the Calgary Herald (November 2, 1960, and July 20, 1962); the Globe and Mail (January 2 & 31, March 4, 18, 20 & 23, June 17, and August 10, 1961; March 21, and April 2, 1964; and January 16, 1971); the Miami News (April 13, 1961); the Milwaukee Journal (April 2, 1961); the Pittsburgh Post-Gazette (April 28, 1961); the Quebec Chronicle-Telegraph (April 10, 1961); the Regina Leader-Post (March 23, 1961, and February 9, 1967); the St. Petersburg Times (May 5, 1961); the Saskatoon Star-Phoenix (November 17, 1960, and October 13, 1966); the Toronto Star (June 19, 1956; September 17, and December 14 & 17, 1960; January 28 & 31, February 18, March 6, 11, 18, 20, 21, 22, 24, 25, 28, 29, & 30, April 3, May 9 & 29, August 10, and December 28 & 30, 1961; January 28, 1967; March 16, 1986; and March 9, 1996); and the Windsor Star (January 3, 1963).